Amber is very good with practical math. She can figure fractions and percents easily, but when it comes to Algebra she struggled. Although she has completed Algebra I there were some concepts she struggled with. 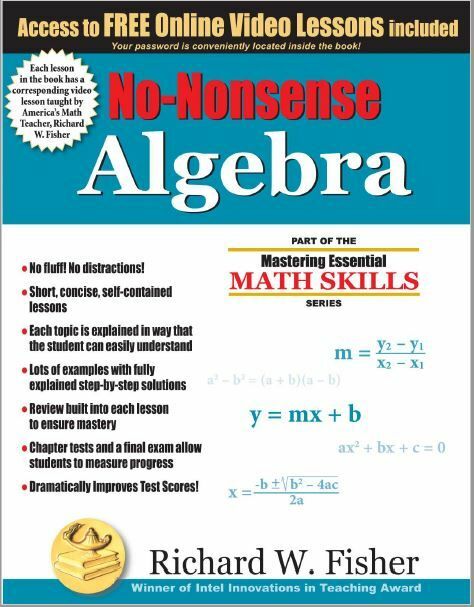 I wanted her to go back and see if we could get those concepts to make sense to her now so I have been having her complete some lessons in the No-Nonsense Algebra book from Math Essentials. An introduction and explanation of each topic that is easy to understand. A Helpful Hints section that includes tips and shortcuts. The chapters vary in length and they all have a chapter review and a note from the teacher. These notes are helpful hints and tips to get the most out of your study time. This course was written by Richard W. Fisher and he suggests the student write out each example step-by-step. He wants the student to be fully involved and have a deeper understanding. Each lesson is short and to the point. Amber gets frustrated when things are over explained and she thought these lessons are a good length. The back of the book contains a final review, a ten-page glossary of terms, a list of important formulas, important symbols, and charts of the multiplication table, commonly used prime numbers, squares and square roots, and fraction/decimal equivalents. The answer key is also in the back of the book. The online video lessons are taught by Richard W. Fisher as well. He explains what is going on and the problems are worked on a marker board. Richard graduated San Jose University in 1971 with a B.A. in mathematics and he has been teaching math or developing math materials ever since. As a teacher one-half of his sixth-grade students would bypass seventh-grade and move directly to eighth-grade algebra. Amber struggled with graphing inequalities and the Geometry concepts that are taught in Algebra I. I had her go through Chapter 5: Systems of Linear Equations and Inequalities and Chapter 8: Radical Expressions and Geometry. She didn't complete each lesson as it was intended. She read the introduction and helpful hints and followed Richard's tip about writing down each example step-by-step. The topics she had been struggling with the most she worked some of those problems. She said writing down the example problems were a big help and she loves all the tips that were included in the book. She actually flipped through and read some that were in the other chapters. She also liked how the lessons are short and to the point. She said she likes this guy because he isn't too wordy. Math doesn't come very easy for her younger sisters either so I will have them use this book along with their regular curriculum because they aren't much for change when it comes to math.